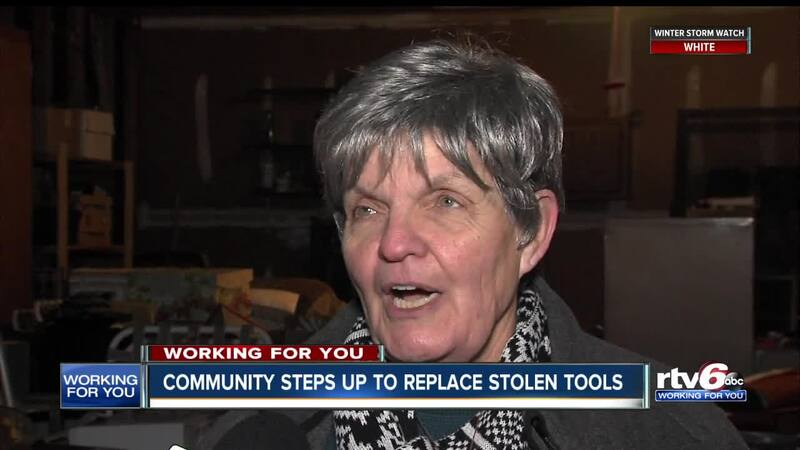 INDIANAPOLIS — An RTV6 original report had viewers reaching out to offer help for an Indianapolis family, who had their work truck and tools inside stolen — threatening the family's livelihood. This was not a typical burglary case, as the family could not just go back to work to replace what had been stolen. Because after it happened, they didn't even have a hammer. Jody Niemantsverdriet had his ability to feed his family stolen last weekend. But the story really starts more than thirty years ago — when Barbara met John. "Anything that broke in the restaurant, he could fix it," Barbara Williams said. "He had a tool for every job." John Williams passed away five years ago, and his tools have been sitting in the garage ever since. "I saw the story on your newscast and it made an impact on me," Williams said. Williams invited Niemantsverdriet over to have a look, and told him he was welcome to all of the tools. Drills, a ladder and saw, all to help get the family business back up and running. "It says in the bible that, ya know, it's more blessed to give than to receive. And so I pray that she really gets a blessing in her life," Niemantsverdriet said. For Williams, the reward is knowing her husband's tools are going to someone who deserves them. "I want them to go to a good person. That will use them and will help him in his life, and I think I've done that and I think John will be very pleased," Williams said. Niemantsverdriet is still waiting to hear from insurance company about replacing more of his tools. But he says he now has a great start to get back to work doing general contracting.